Sterling Precision has been in business since the mid 1970’s, and has a reputation of producing high quality Blow Molds, for the Pharmaceutical, and Healthcare Industry. From design, to production, Sterling has made great strides in the Bottle Industry. 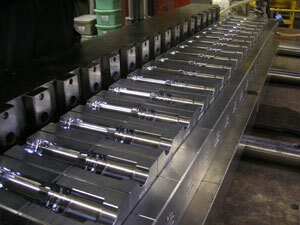 Many of our Mold Makers, have over 20 years experience in the field. We are committed to excellence. Price, delivery, and accuracy are key to our business success. Our customers know, when they receive a tool from Sterling, they can rely on producing quality bottles, the first time, without any issues. ©2008 Sterling Precision, Inc. All Rights Reserved.